This past weekend, I took another excursion to continue my tour of some of Naha and Shuri’s historical and scenic spots. Last week, I visited the scenic surijo dam, but this week I was lucky enough to visit one of Okinawa’s most beautiful gardens—shikina-en. Also called shichinanu-den, this was the largest second residence for the Ryukyu royal family and was used to entertain royal family members and foreign guests. Upon my arrival, I was directed to a gate where adults pay ¥300 and children ages 12 and under pay ¥100 for admission. Once through the gate, a trail opened up before me leading through various tropical plants, trees, and flowers towards the unseen garden up ahead. The first site you will approach is sei-mon, the main gate. This gate was used extensively by Ryukyu royal family members and Chinese delegates for the coronation of kings called Sapposhi. Next, you’ll come to ikutoku-sen, a spring serving as the source of water for the pond in shinka-en. From here, you’ll approach the pond. Starting here, the park becomes very photogenic, so don’t forget your camera at home. At the pond, I decided to first tour uden, a wooden house built in a style exclusively permitted to members of high society. Here, you can actually walk inside the house. Pictures are set up inside uden, and park employees will fill you in on the park’s historical details. 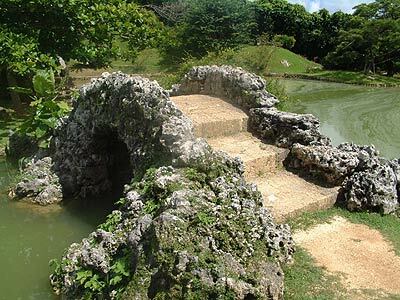 Next, I crossed two Chinese style stone bridges called ishi-bashi built on the small island in the middle of the pond. These, in my opinion, are the most picture perfect parts of the shinka-en. You’ll also see a hexagonal building called rakkaku-do built on a small island of the pond which served as a place of rest. 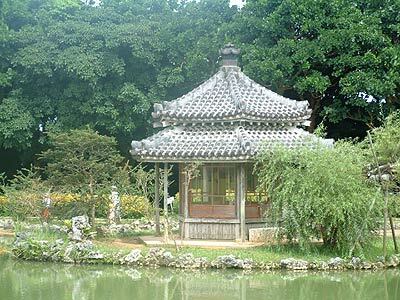 It is characterized by its Chinese style black tiled roof which was made from a single block of Ryukyu limestone. 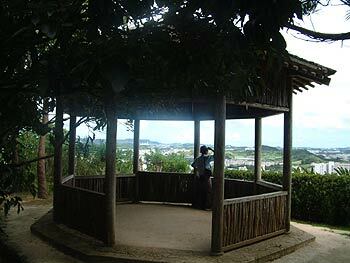 Further ahead, you’ll come to garasa-mui, or crow hill, and kanko-dai, an observatory with a scenic view overlooking much of Shuri. Under the shade of the observatory’s tiled roof, this is an ideal place to take a rest and soak in what you’ve just seen. From here, you can either head towards the exit or double back to the pond. There is no time limit or absolute path you must follow, and there are many small noteworthy side spots you may wish to check out such as the banana farm, so I recommend you return to the pond for a second look before leaving. I also recommend that visitors stay at shikina-en at least an hour to an hour and a half to see everything. From April 1 to September 30, the park is open from 9 p.m. to 5:30 p.m., and from October 1 to March 31 the park closes at 5 p.m. However, every Wednesday is closed unless it is a Japanese holiday. For more information, call the Shikina-en Superintendent Office at (098) 853-5775 or the Cultural Assets Section of the Naha City Board of Education at (098) 853-5775. Driving to shikina-en is fairly easy. If you are driving south on the Okinawa Expressway, get off at exit 1 and turn left. Ahead, the road separates, so get on route 222. A short distance further, you’ll see a large parking lot maybe with a few tour busses parked inside. This is the shikina-en parking lot. Park your car here and walk to the entrance. After paying the entrance fee, you’ll be given a brochure in English or Japanese detailing the various spots inside the park. Good luck on your adventure!